Look at the top of the results sheets for U.S. UCI cyclocross races in the second half of the 2000s and you are likely to find the name Deidre “Dee Dee” Winfield. The then-Virginia resident raced near the front of the domestic UCI scene for a half decade, finished as high as fourth at Elite Nationals in 2006 and was a member of the 2007 Worlds team. After seeing Winfield race on Saturday, her quip about being “washed up” is about 100 miles of gravel from the truth. Winfield survived a tough challenge from Kristen Legan and Jenna Rinehart to win the Women’s title at the 2018 Almanzo 100 gravel race in Minnesota. With the changes in cyclocross and gravel technology, however, some might argue her winning carbon Blue Norcross SL frame that dates to the 2011 model year with rim brakes, inner tubes and inline brake levers might also deserve the moniker. 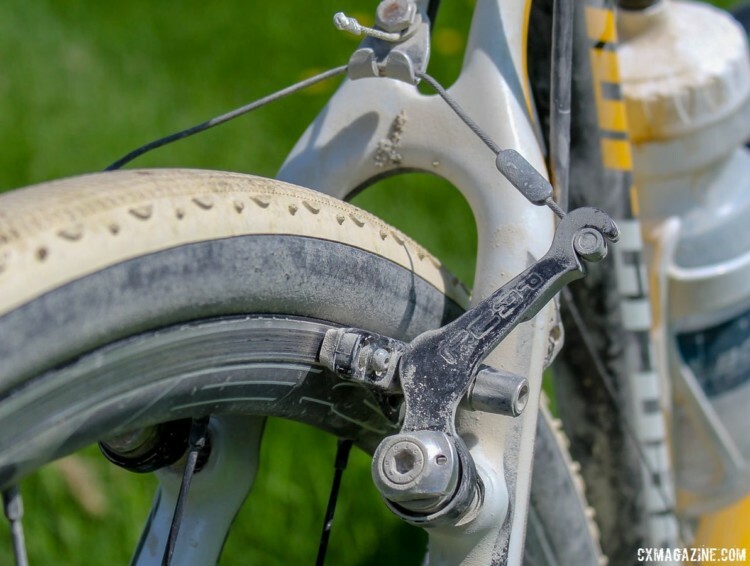 With her win on Saturday, Winfield showed her bike is still up for the gravel grind. 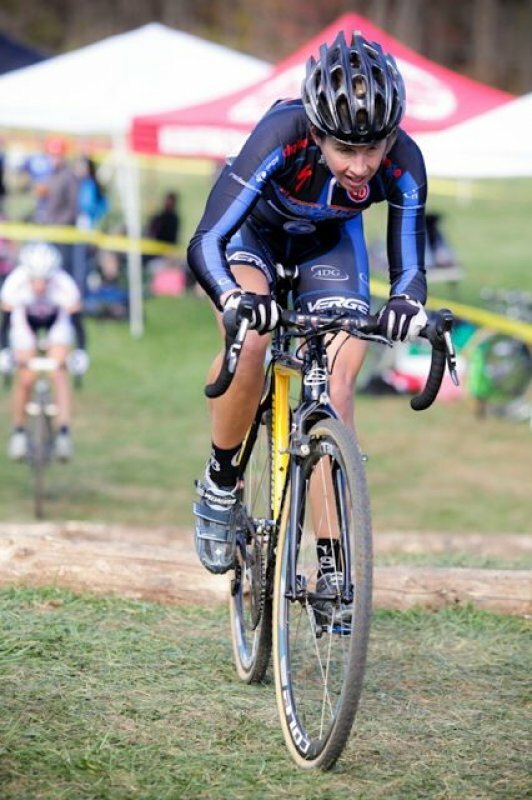 Winfield looked like an endurance pro on her semi-throwback carbon Blue Norcross SL on Saturday. Today, we profile her Almanzo-100-winning ’cross cross-over gravel bike. 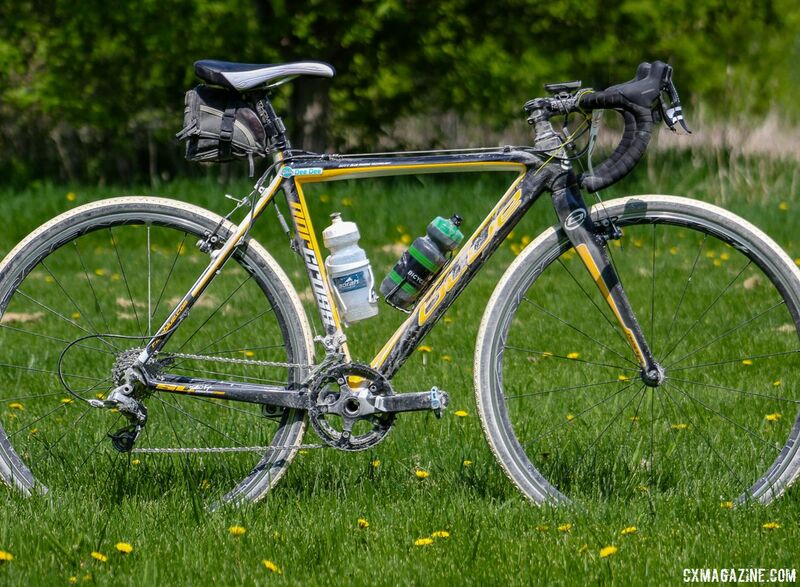 Winfield’s frame was the black and yellow carbon Blue Norcross SL. One thing that is notable about the frame is it is one of the Jonathan Page Signature Series bikes Blue made to help support his European racing. 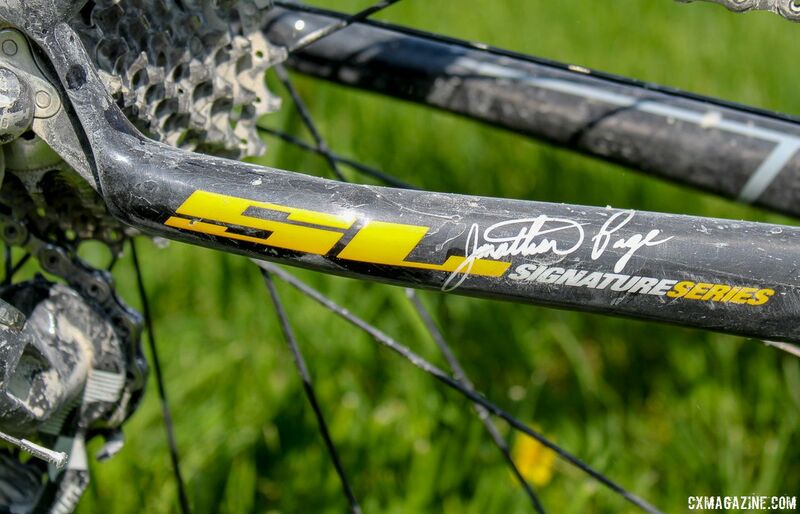 Similar to what Katie Compton did for the Trek Boone, Page provided input on the frame’s geometry to suit his tastes. Fortunately for Winfield, as a now-former Blue-sponsored athlete, she did not have to break out the checkered tape to ride the frame in a race. “I like how it feels,” Winfield said about the bike. “It fits me really well. It corners well. I love it.” She also added that she has hung onto it because it is from the days when equipment was free for top riders like herself. Winfield’s Norcross SL frame is from the days before disc brakes became the norm. The Norcross SL came stock with TRP cantis, but Winfield has since switched to Paul Components Touring cantilevers in the rear and Paul’s Neo-Retro cantilevers in the front. Winfield moved to Minnesota from Virginia a few years ago an decided to keep it local to her new home with her wheels. She ran rim brake HED. Ardennes alloy clinchers with white Challenge Grifo XS clinchers mounted up. 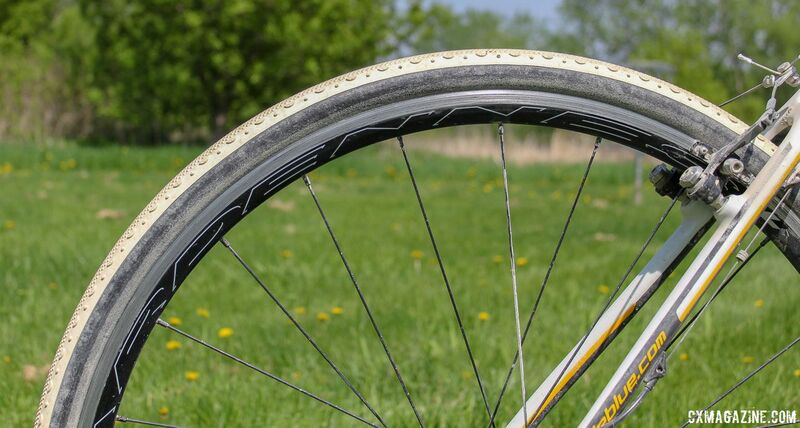 The Grifo XS clinchers are discontinued and pre-date Challenge’s new tubeless-ready tires, so Winfield ran them with tubes, which is arguably rarer than seeing cantilever brakes at a gravel race these days. 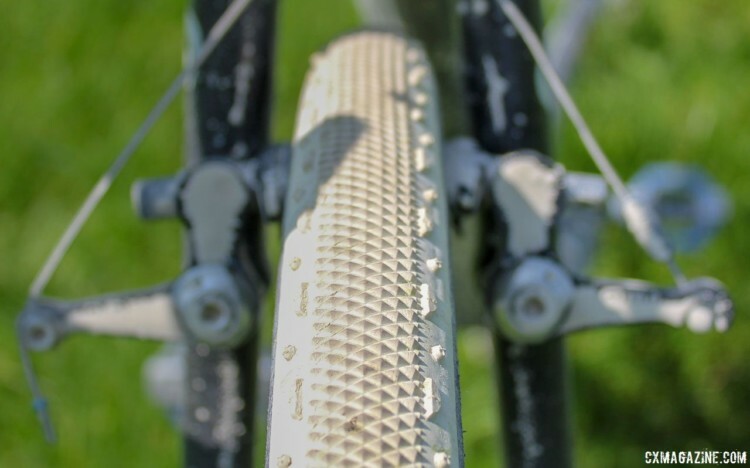 In a perfect bit of je ne sais quoi, the Grifo XS now lives on as the Challenge Almanzo gravel tread. The first half of the Almanzo 100 course featured a hardpack base with medium gravel covering the surfaces in spots. Some of the surface was exposed, leaving fast A lines in spots. The second half of the course—from about mile 65 to mile 85—was covered by freshly laid gravel that tortured riders as they tried to plow through the thick road surface. Winfield’s drivetrain was 10-speed SRAM Force. Her front chain rings were Thorne Koksijde 44/36t and her rear cassette was … she was not really sure. The cassette had enough teeth for her to stick with Legan up the Almanzo course’s last big climb and then attack to get away for her winning margin. 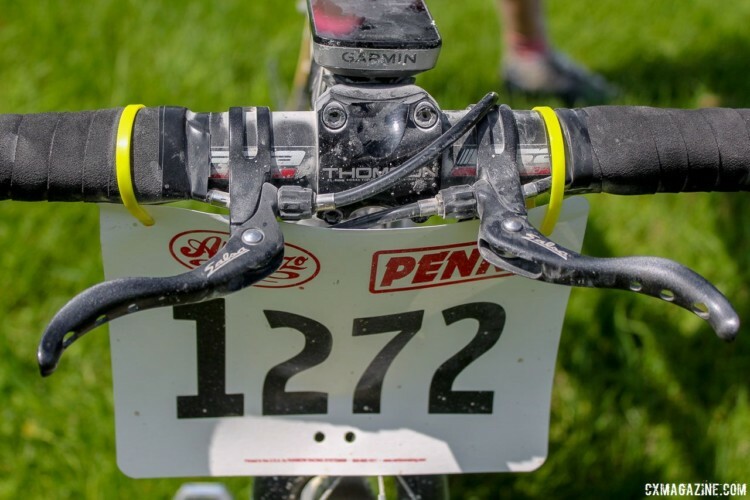 Up front, Winfield ran an FSA handlebar with an alloy Thompson Elite X4 stem. She used a Garmin 820 computer to track the route and miles and attached her 1272 number plate with very matchy-matchy yellow zip ties. 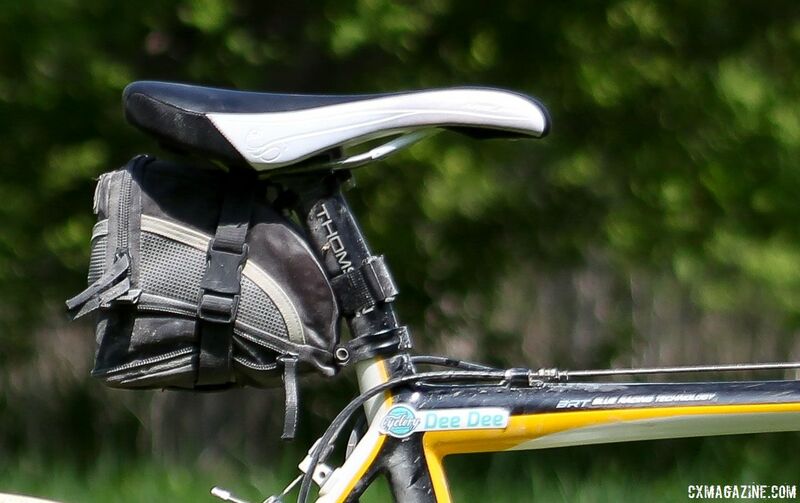 To round out her contact points, she had a Specialized Ariel Women’s saddle and Crankbrothers Candy 3 pedals. See the specs and photo gallery below for a closer look at Dee Dee Winfield’s Almanzo 100-winning Blue Norcross SL. 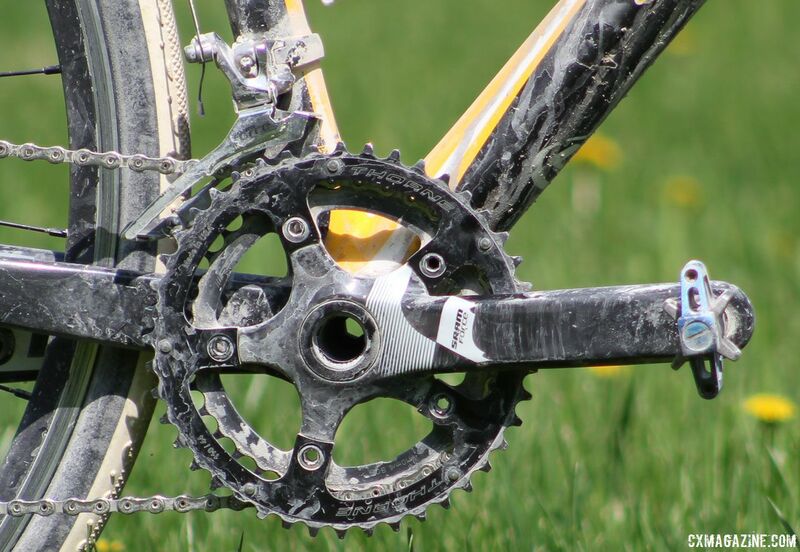 For more from the Almanzo 100 gravel race, see our impressions of Shimano’s new Ultegra RX800/805 clutch-based derailleur. Looks like the front (I’m assuming) brake is routed over the bars to avoid the housing clash that you typically get with cross levers. Interesting. Rats …. further confirmation of the adage … “It’s NOT about the bike”. Nice to see someone rocking-it on what is purported to be an out-of-date ride. Now, maybe I need to go and do some training ….?? How could anyone be competitive on a seven year-old bike? That’s 49 in dog-years.